In 1990, I joined the team at the Royal Belfast Hospital for Sick Children as a Nursery Nurse, before becoming a Play Specialist two years later. I worked for three years on a Medical Ward as a Play Specialist, looking after patients with cystic fibrosis. I really loved those years. At that time, the Children’s Haematology/Oncology Unit (CHU) didn’t have a Play Specialist, so I asked if I could provide two afternoons a week for their patients. After nearly two years, I had to decide which Ward/Unit I would work in full-time. 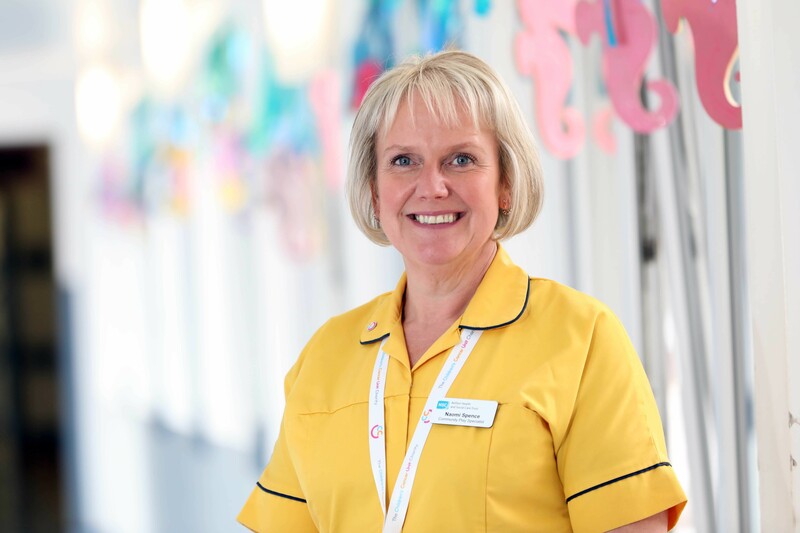 Thanks to The Children’s Cancer Unit Charity, who supported my new Play Specialist post, my career moved into the world of Haematology/Oncology. As demand increased for the service, I was able to work alongside another Play Specialist, Sophie Rea, and move part-time into management, a role created by the Play Department. The Play Service Coordinator’s post soon became a full-time job. With continued support from The Children’s Cancer Unit Charity, Sophie took over CHU. The Play Department grew to a team of 22 Hospital Play Specialists – an incredibly busy time and such a learning curve. I continued to help when I could with patients in CHU, but I soon realised that I missed working so closely with patients and their families. So, I put a business plan together and created the Haematology/Oncology Community Play Specialist post. This allowed me to travel across the country, visiting patients and providing this specialist service to them in the comfort of their own homes. Supporting children in Northern Ireland with cancer through play is my dream job. This wouldn’t have been possible without the fantastic team at the CHU and The Children’s Cancer Unit Charity, who provide our team with equipment, training and the support to allow extra staffing at the Unit. I have worked at the Royal Belfast Hospital for Sick Children for 28 years and loved each and every one of them. The sciences were my favourite – biology, chemistry and even physics. Did you go on to further/higher education? If so, what did you study and where? After school I went to the Hollywood campus of Bangor Technical College – now known as the South Eastern Regional College. There I studied for my Nursery Nursing qualification, or NNEB. I nannied for a local family for some time before working at a day nursery in Belfast. When I saw Nursery Nurse posts advertised for the Royal Belfast Hospital for Sick Children, I knew it was the job for me. This was my first step into hospital life. No. Growing up, Kylie Minogue – during her Neighbours days – had a great influence on me so I wanted to be a mechanic. She made it look so easy and quite romantic. Back then school offered me two options; train to be a nurse or become a Secretary. To become a Play Specialist at the hospital you must have at least an NVQ Level 3 in Childcare, as well as experience of working with children with complex needs – preferably in a hospital environment. It is also essential that you have a passion for play and understand its value when treating children and young people. Other qualifications may be considered, such as a degree in Early Childhood Studies. You need to be compassionate, passionate, adaptable and of course, fun! I love everything about my job and always embrace a challenge. You must be respectful of everyone’s beliefs and mindful of the situations they face. Every day, I work with great teams and families from right across Northern Ireland. I could be in the clinic, preparing a child for treatment, chemotherapy, or medicine; or in a family’s home, helping them to build their confidence up and to understand their condition. Preparation for treatment can take many forms. The Children’s Cancer Unit Charity recently helped our team to develop an innovative app which allows us to reduce anxiety and fears in the run up to a procedure, such as a CT or MRI scan. We use the CCURelaxIt app on an iPad, monitoring the child’s heartrate and helping them to feel in control. What is incredible about this app is that it reduces the need for an anesthetic. Working within a fabulous Haematology/Oncology team of professionals who are so passionate about their work is brilliant. We also have the support of The Children’s Cancer Unit Charity, which helps us to carry out our essential work. The most challenging – but also the most rewarding – part of my work is when you are invited into a patient’s home and their lives when they are at their most vulnerable. Supporting, listening and helping them take control of the journey ahead, while also making positive memories, is a privilege. This role complements and supports the patient’s cancer journey and focuses on the family as a whole. My service is provided in the family home to reduce travel to hospital. It helps make an abnormal situation feel normal and this is all delivered through play at the patient’s level of understanding. Do it and make a difference. Start small, let your ideas grow and children, young people and their families will benefit. If you weren’t doing this, what would you like to do? If I had an endless supply of money, I would love a castle with land, so I could provide a loving home for children, dogs and donkeys. Keep calm and believe that what you are doing will make a positive difference. Spending time with Kyle and Gethyn, my family. We try to squeeze so much fun in. We could be up the Mourne Mountains with our two dogs, catching up with family and friends or discovering new places. Days out often involve using our National Trust cards or supporting The Children’s Cancer Unit Charity. Play to your passions. Look for a job you know you will love and, as they say, ‘you’ll never work a day in your life’.